Ultimate Reset shampoo and conditioner duo for very damaged hair ($106 value). Limited-edition gift set! Gift that special someone (or treat yourself) with the Ultimate Reset shampoo and conditioner duo. ultimate reset shampoo [300 ml]: weightlessly purifies and strengthens the hair returning it to optimum health. ultimate reset conditioner [250 ml]: deeply nourishes and repairs every strand without weighing hair down. For centuries, Japanese women have looked to rice for its immense beautifying powers due to it being enriched with minerals, antioxidants, and B and E vitamins. Referred to as “nuka biji”, or “beautiful by the rice” Japanese women cherish rice’s ability to hydrate and protect the hair. 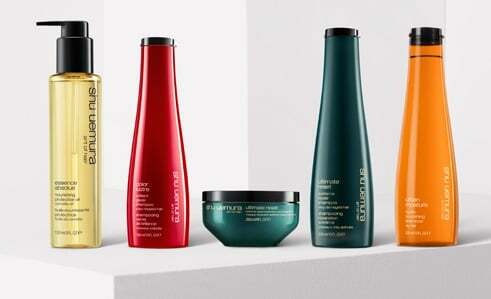 Shampoo: Aqua / Water ● Sodium Laureth Sulfate ● Dimethicone● Glycol Distearate ● Sodium Chloride ● Cocamidopropyl Betaine ● Guar Hydroxypropyltrimonium Chloride ● Coco-Betaine ● Cocos Nucifera Oil / Coconut Oil ● Tocopherol ● Sodium Benzoate ● Hydrolyzed Rice Extract ● Sodium Citrate ● Sodium Hydroxide ● Phenoxyethanol ● Steareth-6 ● Acetic Acid ● Safflower Glucoside ● Peg-100 Stearate ● Peg-45M ● Trideceth-10 ● Trideceth-3 ● Salicylic Acid ● Limonene ● Fumaric Acid ● Benzyl Alcohol ● Benzyl Salicylate ● Linalool ● Amodimethicone ● 2-Oleamido-1 ● 3-Octadecanediol ● Carbomer ● Citric Acid ● Butylene Glycol ● Bht ● Hexylene Glycol ● Glycerin ● Parfum / Fragrance. Conditioner: Aqua / Water● Cetearyl Alcohol ● Behentrimonium Chloride ● Dimethicone ● Glycerin ● Tocopherol ● Hydroxyethylcellulose ● Hydrolyzed Rice Extract ● Sodium Citrate ● Phenoxyethanol ● Steareth-6 ● Acetic Acid ● Safflower Glucoside ● Peg-100 Stearate ● Trideceth-10 ● Trideceth-3 ● Polysorbate 20 ● Chlorhexidine Digluconate ● Limonene ● Benzyl Alcohol ● Benzyl Salicylate ● Linalool ● Isopropyl Alcohol ● Amodimethicone ● 2-Oleamido-1 ● 3-Octadecanediol ● Cetyl Esters ● Cetrimonium Chloride ● Citric Acid ● Butylene Glycol ● Bht ● Parfum / Fragrance.